Well, it finally snowed again here in Aspen, Colorado. The timing couldn’t have been better because I, like many visitors and locals, was beginning to get cranky from the lack of snow. 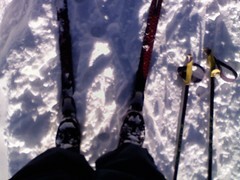 Thankfully, I at last got to engage in one of my favorite wintertime Aspen activities – cross-country skiing. 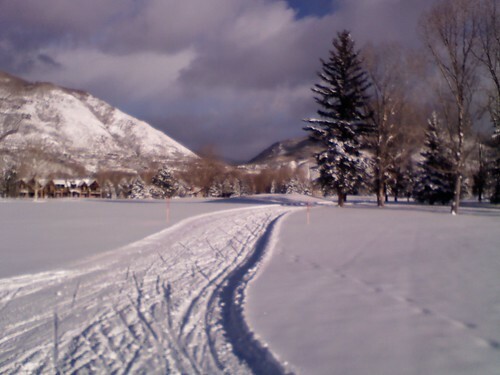 I was pleasantly surprised that enough of the white stuff fell over the weekend so that even though the actual ski tracks were not yet in place, the basic cross-country skiing trails at the Aspen Municipal Golf Course could be laid out. Ah - Finally Some Snow to Cross-Country Ski on In Aspen! The snow quality on the course was excellent, and the activity was exhilarating. I was especially grateful to be able to enjoy the fruits of this long-awaited snowfall after dealing with the not so fun, but obligatory chores of shoveling the sidewalks and clearing the roofs. It finally felt like winter! Now that I have had my first taste of cross-country skiing this season, I look forward to taking advantage of much of the rest of the Aspen/Snowmass Nordic Council’s 60-plus miles of trails. There are so many cross-country skiing venues around here – no wonder they are often collectively called Aspen’s “fifth mountain”! In addition to the golf course, this year I intend to enjoy my other usual cross-country skiing haunts like the Aspen High School Trails, the Iselin/Rotary Trail, the Marolt Trail, the Northstar Nature Preserve, the Rio Grande XC Trail, and the Moore Trail. I also plan on revisiting the Benedict Trail and the Snowmass Golf Course trails, and I’m contemplating heading back to Ashcroft one day. I might even take on some of the some of the 10th MountainDivision Hut Association trails before the season is over. What a difference a good snowstorm makes! Hey Rich, Happy to hear that you got out there on the trails. I'm looking forward to heading out there myself! I'm just learning, maybe we can head out together? Thanks Chris. Great idea -- I often try to get to the Aspen Golf course trails in the afternoons during the week and then go to the High School/Moore trails, etc. on the weekends. Don't know if I'll make it this afternoon, but maybe tomorrow -- I'll let you know.